Now, you may want to learn how to answer these questions. 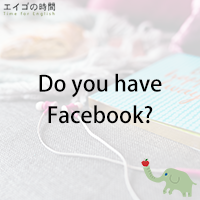 Let’s say someone asks you, “Do you have Facebook?” To answer this question you can say, “Yes, I do. I have Facebook. Or, “No, I don’t. I don’t have Facebook”. If someone asks you, “Are you on Twitter?” Your answer may be “Yes, I’m on Twitter” or “No, I’m not on Twitter”. It can also be “No, I’m not on Twitter. But I’m on Facebook”.